Thanks for this timely and helpful post. So true that '5 minutes' can turn into an hour or more. With me, it's the Blogosphere more than Facebook, but same concept. I suffer from frequent bouts of internet fatigue and feel the need to step away periodically. Can't wait for the end of this month! LOL Too much sitting at my computer has caused me to gain (more) weight and I need to rectify that! This is an excellent reminder, everything you have written here is true. It is so easy for hours to pass while we sit engrossed in Facebook, blogs, or news updates. We pass through our days, phone in hand, not even really connecting with those in our families. 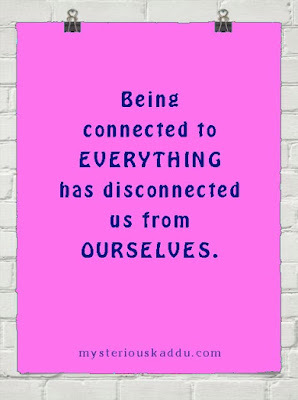 I love my electronic connections to the world, but there is a need to put them down for awhile, listen to our hearts, connect with others, and actually live in the moment. Very thoughtful post! This is so interesting, and I agree with all of it! My husband is especially guilty of not being able to unplug. Even when he's not on the computer, he's still kind of there mentally. We've found that vacations that separate us from our media (cruises, camping) are the best for recharging. 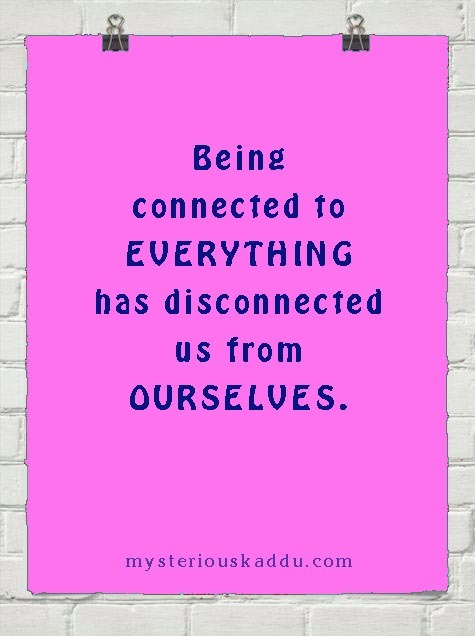 You know it's good to unplug but sometimes, when I unplug for too long, there is so much I miss between those wee hours of unplugging! Just what I needed to read today. I'm down with a splitting headache today presumably due to overuse of my smartphone. I've been trying not to reach out for it hoping that the headache subsides, but I just haven't been able to do that for more than 10 minutes. A few months back, I had deactivated my FB from my smartphone and would log in only once in a day from my lappy. That itself made so much of a difference. Your dad is into FB and mine is into WhatsApp. He also has a very happening virtual life. ;) And, hey thanks for taking me back to those yahoo messenger days. Those were some days! This is perhaps my favorite post in this series. I love how you've incorporated the other AtoZ posts in the list, Chicky! I never was addicted to social media, and now I've consciously stopped logging in except once or twice a day to look at mentions. That's it. And I am happy! Hugs! I need to unplug way more often, thanks for the reminder. Ah yes! I know that it's so important for me personally to make sure I don't get too addicted to the internet. Therefore I have guidelines in place that help me take breaks during the day and at least one day a week. Hi Shailaja! I'm thinking of taking a break from Facebook soon. True. Most of us are addicted to it like crazy. I get very disturbed when I realize I'm getting too dependent on something. Exactly, Josie. You summed it up so well! That's what happens Doree! Many of us never come out of these things mentally! I hope your headache cleared up through the night. I will go off FB too next month. You are a source of inspiration for me, Vidya. You maintain your exercise schedule. You maintain multiple blogs. AND you have time for family. Plus, you are always responsive on social media as well. I aspire to be like you do someday! Good to know this post didn't apply to you. You're one of those few rare persons who are online but not addicted to it. Amazing! Breaks every day, and one extended break a week! That is a perfect system, Lydia. I used to be very addicted to my phone up until a little while back and suffered from all the syndrommes you mentioned above. This is exactly why I deleted the FB app from my phone. I rarely log in, and I've noticed whenever I do, I end up seeing something that's upsetting or saddening. Just not worth my time and the injury to my well-being. The bit about your dad was sweet :) Luckily my parents stay away from FB, though their friends keep pestering them. Well... I am so tired to check on facebook, I don't thesedays though I admit some people who I knew at college got connected with them back through facebook. Still nothing beats personal relationship, a real one... I do use fb to network, spread news about events in the City... you have writen a fantastic article. Sometimes its stressful constantly seeing fb, eye strain, brain not processing information, that's the time YOU must disconnect from fb. Perfectly said! Indeed facebook de-addiction clinics have come in several places. It's so sad to see a roomful of people busy on their mobiles and not one person has time to 'talk' to each other normally! We often find people complaining about the usage of Mobile Phones and Computers, that these things are ruining their social life and it does irritate when you are pouring your heart out to someone and he/she keep on looking at his/her beeping phone...... Undoubtedly there has to be a balance of their usage , there are moments when we should just leave our phones and PCs for an uninterrupted human interaction. Shalini, I still tend to get addicted to my phone apps turn by turn. But, if I notice myself spending several hours per day on a single app, for 3 consecutive days, I uninstall it from my phone. That's how I keep myself sane. Sreesha, I also don't have the FB app on my phone currently. No social media app, actually. I find it better this way too. Agree with everything you said, Stefinia. Nothing beats one-to-one conversations in real time. Agree, Irfanuddin. It does get very annoying when the person you're trying to talk to is busy with his/her phone!